See Dr. Mackenzie’s Scar Revision photos HERE. Ugly scars from accidents, surgeries, or other incidences can be a source of discomfort for many people, causing them to cover their bodies to avoid awkward questions or explanations. Advances in plastic surgery and post-operative care however, can give people freedom from self-consciousness related to unsightly scars. While no scar can be completely removed, Dr. Mackenzie can make scars significantly more discreet. 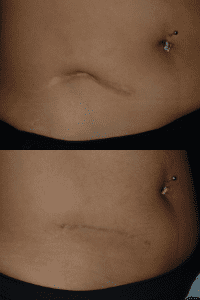 The photo set on the left shows an early result after an appendectomy scar revision. This scar will continue to improve over time. Dr. Mackenzie commonly performs plastic surgical scar revision in Santa Barbara on C-section scars, facial scars, surgery scars, and many others. Depending on the size and severity of the scars, the surgery may be done under local anesthesia or general anesthesia upstairs at the Surgical Arts Surgery Center. Some complex scars such as burn scar contracture, or scar-like conditions such as Dupuytren’s contracture, require special surgical techniques and may even require physical therapy afterward. Scars are often a three dimensional challenge, not merely too long or too wide. This sometimes necessitates rearranging tissues, releasing tethered skin scars from the underlying muscle, or placing fat grafts. The treatment isn’t finished after the surgery. Dr. Mackenzie will also institute a post-surgical scar management regimen to minimize the appearance of the scar. We use Biocorneum and add Skinceuticals vitamin C containing topical serum. Occasional patients may benefit from post-surgical tension release using the Embrace product. Sometimes surgery is not the best option to improve a scar. Other techniques of improving scars may include treatment with lasers or IPL, steroid injection, or topical treatments using silicone products. Please read an informative blog post on scars from September of 2009 for more information on scars and scar revision. Contact Pacific Plastic Surgery for more information about scar revision and how it can reduce the appearance of your scars.